As if the disgusting attack on Congresswoman Gabrielle Giffords & others was not sickening enough, the left wing response; in the media, from Pima County Sheriff Dupnik, and in places such as Yahoo news feedback, is just downright sickening and truly makes me worry for our Nation. 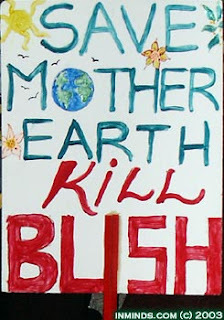 Nut jobs such as Jared Lee Loughner are sadly always going to exist (just look at some of the bizarre and downright evil comments posted on "Twin Towers" 9/11 YouTube videos, of which he was one of the nut jobs that believed this was a conspiracy), but it is the misquote, and downright hatred by those on the left attempting to pin this on Sarah Palin, Rush Limbaugh, Glenn Beck and others. Sorry left wing hate mongers, first this is an act of evil that is sick and wrong regardless of her political views (a Democratic Republic cannot stand when this kind violence is accepted by either side, which most reasonable persons on both sides of the aisle agree with). Just a little research (which anyone can do) turns up the fact that Jared Lee Loughner is a fan of Karl Marx and Hitler. By the way the Nazi party is not a party of conservatism, as anyone who's has studied Hitler's views knows that he supported extreme government control over business and more. The full name of the Nazi Party, is "National Socialist German Workers' Party"; keyword Socialist!!!! It is also a fact that many around Jared Loughner were scared and worried about his dangerous mental condition, such as his classmates. "@antderosa As I knew him he was left wing, quite liberal. & oddly obsessed with the 2012 prophecy." 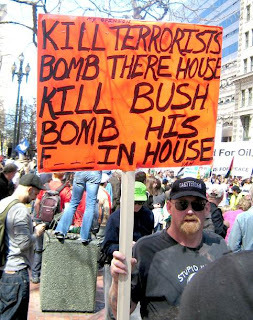 Also those on the left seem to conveniently forget about the extreme hatred toward George W Bush and the many protests calling for his execution that the Left swept under the rug. *The media instructed us to "not rush to judgment" as to the Fort Hood Shooter: "We cannot jump to conclusions," said CNN's Jane Velez-Mitchell that same evening. "We have to make sure that we do not jump to any conclusions whatsoever." Yet the world knew that Hasan reportedly shouted "Allahu Akbar!" before he began shooting, visited websites associated with Islamist violence, wrote Internet postings justifying Muslim suicide bombings, considered U.S. forces his enemy, opposed American involvement in Iraq and Afghanistan as wars on Islam, and told a neighbor shortly before the shootings that he was going "to do good work for God." While any any intelligent person knows that in context Obama was not calling for his supporters to bring a gun to a debate with Republicans, but then the so-called "hate speech" from the right is no worse than this and in fact most conservative speech I have ever read or listen to goes after the policies, lies, etc. 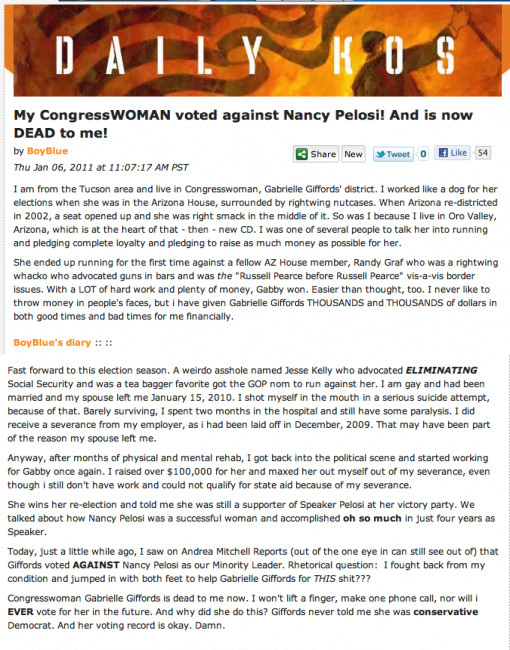 of persons such as Nancy Pelosi, nothing even similar to Obama's comments. Also as for Rush Limbaugh, hoping Obama fails in his agenda is not hate speech despite the many media attempts to spin it that way and the many gullible persons that believe this or that Sarah Palin said "I can see Russia from my house." (this was Tina Fey on SNL). She said "They're our next door neighbors and you can actually see Russia from land here in Alaska, from an island in Alaska" which is geographically correct. The bottom line is this attempted murder and murder of 6 others including U.S. District Judge John Roll of which this is a despicable act that anyone who brings politics (especially based on lies and innuendos) into this tragedy is just plain sick and evil. Sheriff Dupnick’s irresponsible remarks declaring Arizona a “mecca for racism and bigotry” and blaming heated rhetoric on the right for the shooting following this tragedy point to someone who should be standing in the unemployment lines (this guy is an official? He appears to more of a muck raking sleaze to me!!). This sleazy Sheriff Dupnick needs to be removed from office, NOW!! !